Voltou! Acumule o triplo de Avios em voos British Airways! Dica do ótimo blog britânico Head For Points: a British Airways voltou com sua promoção de Avios em triplo! Como sempre, é necessário o registro prévio no hotsite. Os voos devem ser completados até 31 de março de 2017, e são válidos somente para os voos no meta BA, além de voos realizados na AA, Iberia e Finnair entre Europa e América do Norte, onde conste o prefixo BA no voo. O triplo de Avios é calculado unicamente sobre os Avios-base, excluindo qualquer bonificação referente à classe de cabine ou tipo de tarifa. 1) This promotion is only open to Eligible Participants. An Eligible Participant is a British Airways (“BA”) Executive Club Member, resident in the participating countries, aged 18 or over, who books and travels on a Qualifying Flight (see definition below). BA reserves the right to verify the eligibility of Eligible Participants. By taking part in this promotion, Eligible Participants confirm that they accept the terms and conditions set out below. b) book and fly up to (and including) 31 March 2017. Triple Avios Points will be awarded on the first 8 flight sectors. A sector is a single qualifying flight between the point of departure and final destination with no scheduled change of aircraft. 3) Eligible Participants must quote their Executive Club membership number at the time of booking each Qualifying Flight and also at check-in for each outbound and return part of their journey in order to qualify for the promotion. 4) Subject to Clause 6, a Qualifying Flight is a published or corporate negotiated net fare flight in any selling class or cabin, with: (i) a BA prefix on a BA long-haul or short-haul operated service or (ii) a BA prefix on a transatlantic flight operated by BA, American Airlines (AA), Iberia (IB) or Finnair (AY) between the EU, Norway, Switzerland and North America, Mexico and Puerto Rico (iii) an OpenSkies service from Paris Orly to Newark or New York JFK (iv) all domestic and regional BA (operated by Comair) flights within South Africa. The promotion does not apply to travel on flights operated by any other BA franchisees, codeshare partners or oneworld Alliance members. 5) All flight bookings are subject to availability. 6) The Qualifying Flights for all sectors of the journey must be booked, ticketed and purchased in a participating country, and all travel must be completed within the Promotional Period. 8) Eligible Participants who book and complete their journeys on Qualifying Flights within the Promotional Period will qualify for a triple Avios bonus based on base miles. 9) Eligible Participants will receive triple Avios Points before any cabin or tier bonuses on all tickets except reward flights. 10) Eligible Participants can calculate the number of Avios Points they can collect through this promotion on a Qualifying flight by using the following link: http://www.britishairways.com/travel/calculatemilesandpoints/public/en_gb). Please note that this calculator will give the total Avios Points awarded for the whole journey which includes Base Avios, Cabin Bonus and Tier Bonus (where applicable). 11) Avios Points will be credited to the member’s account for which details have been provided within 24 hours of completion of the Qualifying Flights. Avios Points are not transferable and no cash or credit alternative will be offered. This promotion has no cash value. 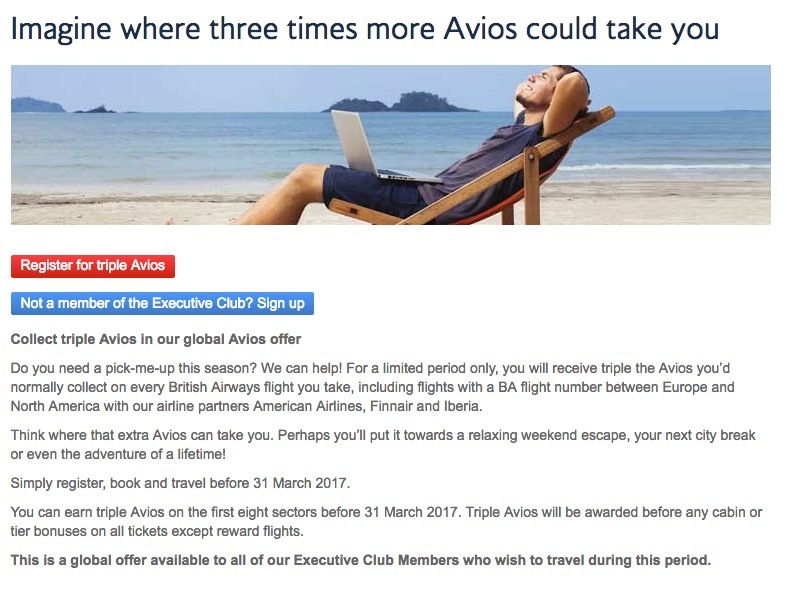 All Avios Points and Tier Points are issued subject to the Executive Club membership terms and conditions, a copy of which can be viewed at:http://www.britishairways.com/en-gb/executive-club/terms-and-conditions?source=MNVEXC1executive_club_terms_and_conditions. Eligible Participants will qualify for Bonus Avios Points on the first 8 separate Qualifying sectors booked for travel within, and completed during, the Promotional Period. 12) Bookings made over the telephone from the UK and Ireland will carry a non-refundable £5 offline booking fee per person per ticket. Calls cost up to 5p per minute from a BT landline. Calls from mobiles may vary. An offline booking fee of ZAR120 will be charged for Comair bookings made from South Africa. Bookings from other participating countries may incur a booking fee. Please contact your travel agent / travel partner for any applicable service fees when purchasing a ticket from them. 13) Qualifying Flights are subject to availability and capacity control in the booking classes eligible for this promotion at the time of booking. BA does not accept any liability in the event that Eligible Participants are unable to book a Qualifying Flight for their chosen period of travel. 14) This promotion cannot be used retrospectively. This promotion only applies to those who book and travel up to the period stipulated in 2(b). 15) Eligible Participants who change their travel arrangements after the date of booking will not be eligible for any Avios bonus award unless their revised travel arrangements also qualify under the terms and conditions of this promotion. 16) All bookings under this promotion will be covered by the fare rules and conditions of the original fare. This includes any applicable refund and change fees. All refunds are subject to the fare rules for the class of ticket booked. Fare rules and conditions appear in your booking details when you access your booking on ba.com through the ‘Manage my booking’ functionality. 17) This promotion cannot be used in conjunction with any other offer, promotion or deal, including but not limited to: (i) redemption bookings; (ii) travel agent or industry discounted fares (including agency, industry, employee discounts), inclusive holidays, group discount fares, child/infant fares or senior citizen fares, whether or not booked in one of the qualifying classes; and (iii) bookings made with vouchers (e.g. shareholder’s discount voucher). 18) All Passengers are carried by BA in accordance with its General Conditions of Carriage for Passengers and Baggage (copies available on ba.com, at “Legal” – “General Conditions of Carriage”) and its Notice and Conditions of Contract as stated on each ticket or itinerary as provided. 19) BA reserves the right to cancel this promotion or amend the terms of this promotion without notice in the event of major catastrophe, war, strike, civil or military disturbance, earthquake or any actual, anticipated or alleged breach of any applicable law or regulation or any other similar events beyond the reasonable control of BA. 21) BA is in no way liable for the reproduction or indirect access via third party website or homepage access which reproduction misstates or omits any of the information or terms and conditions of this promotion. c) If you are a resident of a country which is a signatory to the Rome Convention, your contract is governed in all aspects by English law but you will have the benefit of any mandatory rules of law applicable in your country of residence. 23) Promotional materials form part of these terms and conditions. These Terms and Conditions will prevail in the event of any conflict between these and the promotional materials. 24) The promoter is: British Airways Plc, Waterside, PO Box 365, Harmondsworth, West Drayton, UB7 0GB. Registered No. 1777777 England. Ótima oportunidade de garantir Avios extras em voos no metal BA. Vale destacar que clientes que compraram as passagens ano passado, mas viajarem até 31 de março de 2017, também serão contemplados com o triplo de Avios. Isso é especialmente útil porque a British Airways também participou da guerra de tarifas em classe executiva travada em outubro do ano passado, conforme noticiamos no blog. Esse fato abre uma oportunidade sem precedentes de maximização de acúmulo de pontos para os brasileiros, que compraram tais passagens, desde que escolham o BAEC para o crédito dos pontos. Sobre a oferta de Avios em triplo do ano passado, acessem esse link.